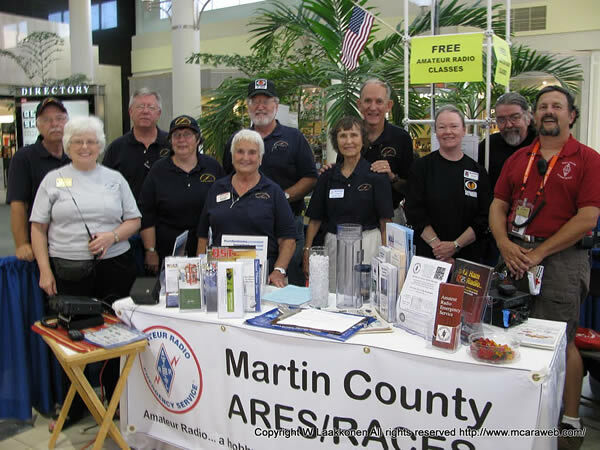 Martin County ARES, Inc. "The Martin County Amateur Radio Emergency Service / Radio Amateur Civil Emergency Service (ARES/RACES) is composed of FCC Licensed Amateur Radio operators who have voluntarily registered their capabilities and equipment for public service communications. Martin County ARES/RACES Inc. is a non-profit organization funded by donations and paid membership and run solely by volunteer efforts." Please note that MCARA and MCARES are separate legal entities with most members in common. Leadership of ARES are appointed by the ARRL versus our club leadership who are elected among club members. MCARA members are not required to join MC ARES but we encourage those who live in Martin County to support ARES. Palm Beach District ARES "We are the Primary back up for Palm Beach County communications in the event of an emergency. ARES® staffs all shelters in Palm Beach County and provides interagency communications. ARES® members receive specialized training in emergency communications from both the ARRL and FEMA." Saint Lucie County ARES "The St Lucie County ARES® is an organized to primarily serve St Lucie County Emergency Management. It provides skilled and trained amateur radio operators to man the Emergency Operations Center, Health Department Special Needs Shelter, two hospitals in the county, City of Port St Lucie EOC, health department ESF-8 Forward Operations Center and the Savannahs Club shelter."